With the refractive index of 1.5 in normal resins, the problem of a high reflection loss arose in cases of adhesion with high refractive index glass and crystal materials. 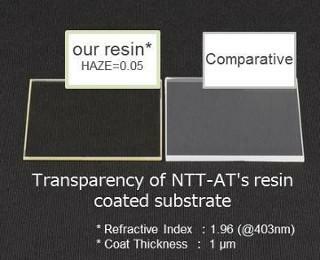 Recently, resins with refractive indices of 1.7 or more, 1.4 or less and high refractive index, low refractive index resins, which are also excellent in transparency in visible light domains have been developed. As well as being adhesives for high refractive index glass and crystal materials, since they excel in transparency while also having a high refractive index, it is expected that they can be used as a coating agent for displays and similar products. Moreover, to match the particular working environment of our customers, we have prepared both ultraviolet curing and heat curing types. *1 : Tends to crystallize at low temperatures. The characteristic values shown in this table are sample measured values, and do not constitute guaranteed performance values.